Celts dominated southern Germany and the northern Alps in the 1st millennium BC. They began migrating in all directions in the 5th century BC, though it is not known when they reached Britain. They were eventually pushed back to the Scottish Highlands in the north, Wales in the west, and Cornwall in the southwest, by the invading Anglo-Saxons who began arriving in the 5th century AD. In the 6th century a large group from South Wales and Cornwall emigrated to Brittany in northern France where they still speak Breton. In the 7th century Scottish Gaelic was introduced from Ireland. Little is known of the Picts whose language died out in the 10th century as the people merged with the Scots. In addition to English, Scottish Gaelic is spoken in Scotland, Irish Gaelic is spoken in Ireland, Welsh is spoken in Wales, Romany has been spoken by travelling gypsies for centuries all over Europe including Britain, Manx was spoken in the Isle of Man until the middle part of this century, and Cornish was spoken in Cornwall until about the end of the eighteenth century. English is primarily a Germanic language stemming from invading Angle, Saxon, Jute and Frisian tribes of northern Germany who settled in England in the 5th century, the beginning of the Old English Period. This language derived from Proto-Germanic, which was the mother tongue of German, English, Dutch, Swedish, Danish, and Norwegian. 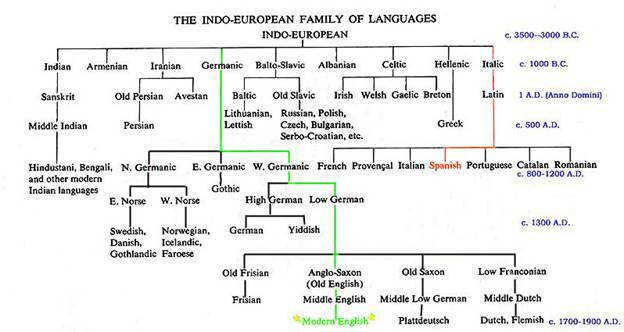 It was the main branch of the prehistoric Indo- European language. The Angel-Seaxans were the English Saxons, as opposed to the Ald-Seaxans. the Old Saxons of the continent. English evolved into a distinct language separate from the original speech of the Angels and Saxons by around the 10th century. Of the 1000 most frequently used words 83% are of Old English origin. Of our remaining vocabulary about 30% are Anglo- Saxon survivals. Tens of thousands of our current words are of French and Latin origin. Old English is predominantly Anglo-Saxon. It also borrowed from church Latin (~450 words) and from Old Norse. 7th century Christian missions to Britain brought learning and literacy, initially entirely in Latin, but an Old English written language did emerge in the northeast and in the West Saxon kingdom of Alfred the Great in the second half of the 9th century. The first known written English sentence, "This she-wolf is a reward to my kinsman" is an Anglo Saxon runic inscription on a gold medallion (about the size of a 50› piece) found in Suffolk, dated about AD 450-480. From the 8th to the 11th centuries Vikings plundered lands adjacent to the Baltic and North Seas. The Danish King Cnut conquered Norway and England, usurping the English throne, in the early 11th century. Large numbers of Scandinavians settled in England throughout the Old English period, giving the language several thousand common words. Old English characters: ash ‘ /a/, thorn /th/, eth /dh/, and schwa. By the mid-1300s English had reasserted itself, with a statute in 1362 enacted in Parliament that all lawsuits be conducted in English. French became a cultivated rather than a native language. The Hundred Years' War (1337-1453) meant French was the language of the enemy country. Black Death (1349-50), which killed off 30% of the people, increased the economic importance of the labouring classes and with it the importance of their language. Geoffrey Chaucer (1340-1400). Chaucer's English (the variety or dialect spoken in London) established itself as the standard. However, from 1250-1400 English adopted the greatest number of French words (40%), and of the nearly 10,000, 75% are still in use. It also changed in fundamental ways, especially in pronunciation and grammar (simpler), from highly inflected (Germanic) to a very analytical (modern). Some dialects retain some of the early pronunciations for a few words (/doon/ for down in northern England and Scotland). In 1476, William Caxton (1422-1491) set up the first printing press in Westminster Abbey. By 1640 there were 20,000 titles printed (mostly in London) in English. This pushed English, written and spoken, towards a standard form. The Dictionary was produced, notably Samuel Johnson's in 1755 (which he did on his own time!). 1650-1800: The Age of Reason (Augustan Age), characterized by a strong sense of order and value of standards and regulations. The language of this time is recognizable today. The `Great Vowel Shift' occurred, and spelling reform. A strong central government used English as the national language for all purposes despite the revival of the classics. Latin and Greek were the most important sources of new words, followed by French, Italian, and Spanish. Most Latin and Greek introductions were deliberate attempts by 16th and early 17th century writers to enrich the language, to elevate `low' English. Words also came in from 50 other languages, largely due to the expansion of the British Empire. The Industrial Revolution and the Victorian Age. Words began to come to England from America. English dialect terms became standard English. The first settled English colony was in Jamestown, Virginia in 1607 who were contemporaries of William Shakespeare (1564-1616), Francis Bacon (1561-1626), Christopher Marlowe (1564-1593) and John Donne (1572-1631). By the 18th century American was recognized as distinct from British English. The earliest sign is perhaps the absorption of Indian words, almost exclusively the Algonquian speaking tribes. American also borrowed many words from Africans brought in with the slave trade, and European immigrants, but they tended to be regional: African in the South, French in Louisiana, Spanish in the Southwest, German in Pennsylvania, Dutch in New York, Spanish being the most pervasive European language that American borrowed from. Many words and pronunciations died out in England but survive in American. Words adopted new meanings in the new world. Great changes were made in 20th century American, with global economic, political, and technological prominence. With the increase in communication, travel, radio and television, all these different types of English have mixed. So in Britain now, because of American and Australian TV programming, we use many parts of Australian and American English. And words from many other languages - French, German, Spanish, Arabic, even Nepali - have been borrowed. So English continues to change and develop, with hundreds of new words arriving every year. For better or worse, it has truly become the world's international language.It has become the language of science, air traffic control, the world of computers, and most of the Internet. And in many countries, where there are other competing languages and people groups, English has been chosen as a common second language. This has happened in Nigeria and Ghana. This may not seem fair to other important and valuable languages which are also international! And it is sad that English people are often lazy, and don't bother to learn other languages! So, for many jobs and situations, English has become an essential gateway.